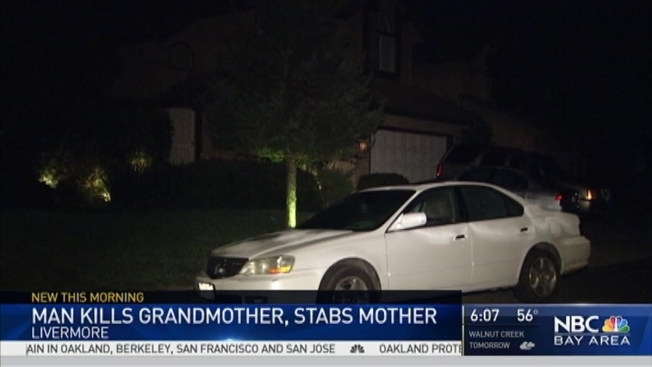 A Livermore man was arrested Wednesday after allegedly stabbing his 85-year-old grandmother to death and injuring his mother with a kitchen knife in the city’s first homicide of the year. Tyler Haskell, 35, was found one mile away from his Hillflower Drive home shortly after the 7:40 p.m. attack was reported, police said. Haskell's grandmother, identified as 85-year-old Joan Lininger, was pronounced dead at the scene, Sgt. TJ Thomas said, and his mother, 62-year-old Karla Haskell, suffered non-life threatening injuries. The suspect fled the house before Livermore police arrived at the scene, but officers apprehended him about a mile away on North Vasco Road, police said. Livermore police said that three homicides were reported last year, but none in 2014. People with information about the case are asked to call the Livermore Police Department at (925) 371-4777.